Three of our very own “came home” this fall as the newest members of the Conrad N. Hilton College Alumni Board – Danny Arocha (’95), adjunct professor, Culinary Arts at San Jacinto College; Wen Kosters-Qin (’11), president of Kosters-Qin Enterprise, Inc. and JuiceWell Cold-Pressed Juicery and Health Bar; and Karla Acosta (‘16, MS ’17), honorary graduate student member and doctoral candidate. With a mission to promote connectivity among alumni and students, Alumni Board President Kaitlyn Venable-Valdez ('12), said this year’s initiatives include a push to provide student scholarships, improve alumni-sponsored events, participate in community service and engage students who will one day come back to serve as advocates for their alma mater. In the past few years, the board has worked with the College's Development & Alumni Engagement office to strengthen the presence of the Hilton College Alumni Association across the country with successful mixers in Chicago, Dallas-Forth Worth, Denver, Las Vegas, Los Angeles and New York, all which have been held in conjunction with major industry conferences. During football season, the Hilton College Alumni Association tent is a popular stop during each Party on the Plaza tailgate. New this year is Monday Funday, a casual mixer held from 6-8 p.m. on the first Monday of every month at Revelry on Richmond. 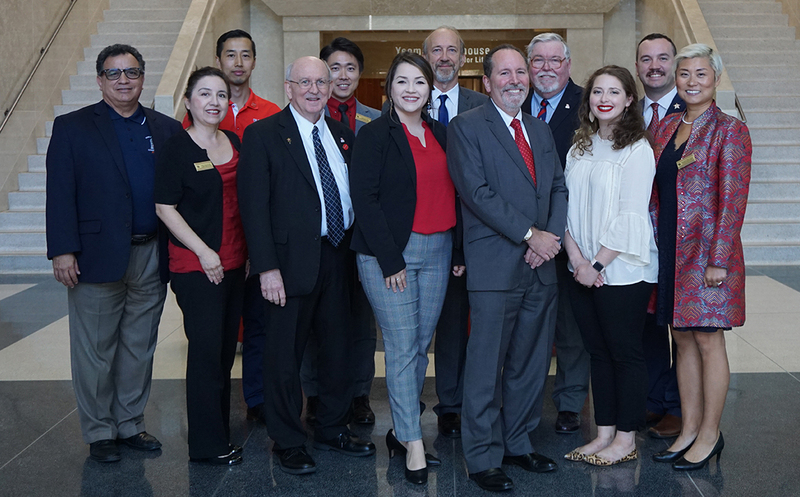 Plans are also underway for the 2019 Hilton College Alumni Association Awards Reception, which will be held at the University of Houston Alumni Center. Scheduled for April 12 on the eve of the 46th Annual Gourmet Night, the reception will also celebrate the College’s 50th anniversary. In addition to this year's new members, the 2018-2019 Alumni Board includes Kaitlyn Venable-Valdez ('12), president; Jessica Lewis ('07), vice president; Noel Stalnaker ('75), treasurer; Xiadoan Mao-Clark (’05, MS '13), secretary; Michael Alcorn ('07), immediate past president; Randy McCaslin, CRE (MBA '80, Hon. '07), past president; and members Ricky Girardi ('10), Mike Przestrzelski (’78) and Patty Sepulveda ('89). They are pictured with Dean Dennis Reynolds and Faculty Advisor Dr. Jaewook Kim. Undergraduate representative Adria Watson, chair of the Dean's Undergraduate Advisory Council, is not pictured. To learn more about upcoming events and the many opportunities to connect with Hilton College, email the Alumni Board or reach out to any of its members listed here.